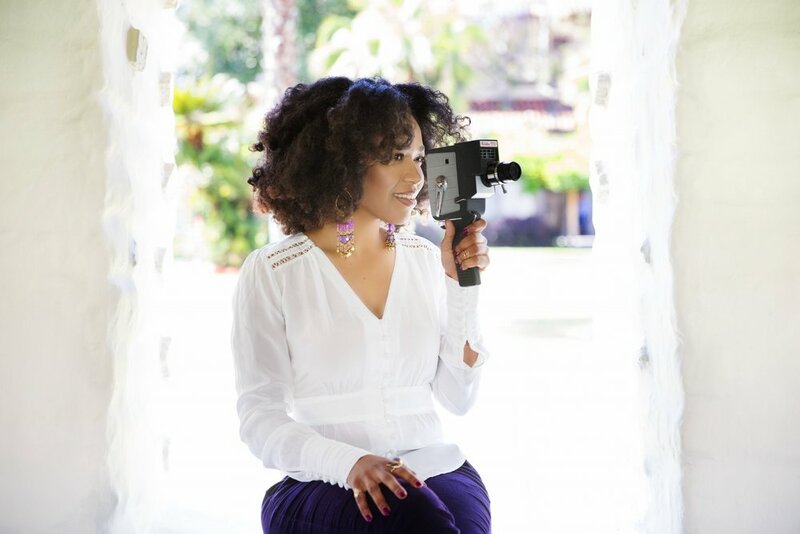 Eliciana Nascimento is an award winning filmmaker. She holds an MFA (Master of Fine Arts) in Cinema from San Francisco State University and a BA in Public Relations from the University of Salvador in Brazil. Nascimento started her career in filmmaking while involved in a women's artistic movement back in 2000 in her home city Salvador-Bahia. She was responsible for communications for a women-only conference and had the task of finding a "camera-woman" to cover the event. Realizing that there wasn't one single woman with the skills in the city, Nascimento took it as a call to fill in the gap. She found her way not only into learning to use a video camera, but she also created one of the first video production companies in Salvador-Bahia led by an Afro-Brazilian woman. After creating and collaborating on various video and documentary projects, she moved to the USA to pursue a formal education in cinema. The highlight of her Masters in Cinema was her thesis film, “The Summer of Gods.” Since its completion, this film has been the recipient of several significant awards. In 2014 it premiered at the Festival de Cannes Short Film Corner, won the Spirit Award and Best Cinematography at the Reel Sisters of the Diaspora Film Festival & Lectures Series, and won Special Recognition in Directing Narrative Short at the Black Star Film Festival. In 2015 it won Best Short at both the Plateau - Festival Internacional de Cinema in Cape Verde and the Global Girls Film Fest. In 2016 it received the Diaspora Narrative Short Film Award from the Silicon Valley African Film Festival and Best Foreign Language Short Subject from the Philadelphia International Film Festival. Nascimento's passion as a filmmaker is to create meaningful films that tell untold stories of the people and traditions of the African Diaspora. She is currently at the research and production stage of a narrative documentary titled “Oshun Women.” The film will feature the stories of Afro-descendant women living in Brazil, Cuba and the USA. It will show how these women deal with issues of race, gender and identity, while looking at the retentions of West African traditions in these countries and, in particular, at the myths of the Yoruba deity, Oshun, as a source of inspiration in the lives of these women. Nascimento's expertise as a filmmaker also comes from several years of experience as a video producer, creating video content for Fortune 500 companies in the Silicon Valley area. As a freelance video producer, she collaborated with San Francisco-based video production company Big Wonderful Inc. and produced a few videos for some of its clients, LinkedIn and the Linus Group. She also worked for three years as an in-house Creative Video Producer for SurveyMonkey, where she had the opportunity to play several roles in the field, like working as cinematographer on a regular basis for several internal and external facing video projects and producing and managing a variety of videos with freelancers and video agencies locally and internationally. She has also worked as the in-house editor in the majority of her projects. At SurveyMonkey, Nascimento collaborated with a talented group of copywriters, designers, motion graphic artists, creative and art directors that inspired her to perform the best at her job. One of her in-house projects was to record a SurveyMonkey Goldie Speaker Series whose speakers were a great source of inspiration for Nascimento to thrive in her career. Some of the speakers were Facebook COO, Sharyl Sandberg, Dreamworks CEO, Jefrey Katzenberg, Netflix CEO, Reed Hast, Task Rabbit CEO, Stacy Brown-Philpot and recently, as a new member of the company's board, the tennis player and entrepreneur, Serena Williams. More than just a series of video projects, this work has taught Nascimento many important life and career lessons. Nascimento is a living proof of resilience through self-motivation and determination. Coming from a challenging background in the slums of Brazil, she found her way to become a celebrated filmmaker in the USA. The child of a working class family, Nascimento overcame a life of adversity and was the first generation in her extended family to earn a college degree. She is still the only one to have earned a Master's degree. Aware of the importance of supporting her community, Nascimento not only engages with her people through the films she creates, but she has also actively been a mentor to a variety of women and people of color in Brazil, Cuba and here in the USA. Being an ordained priest in the Lukumi tradition, Nascimento has mentored people in spiritual matters, relationship, career and self-improvement. Her mentorship work goes beyond guidance to individuals; she has also participated in conferences and community engagements, raising awareness of important social issues.